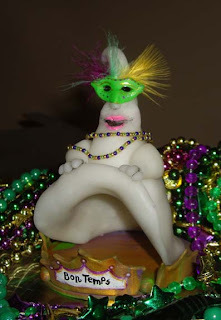 Tiki Woman is a self portrait. I love tikis! there's actually a tiki magazine! I bought it when I was in Hawaii. 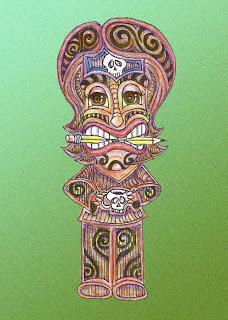 I fell in love with the very cool tiki drawings of an artist called Thor. My tiki woman likes drawing in her jammies. 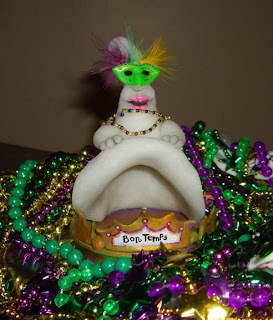 This ghoul has had tee many martoonies and is lifting her sheet hoping to collect more Mardi Gras beads! She's made from transparent polymer clay, wire, feathers and beads. 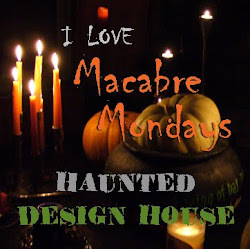 I took a wonderful online class through joggles.com in October. 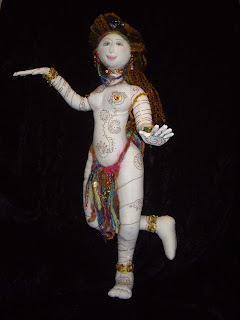 The artist was Barbara Schoenoff and the project was a soft sculpture doll - the Temple Dancer. I set it aside for a while because of, well, life, but I just completed her and here she is! 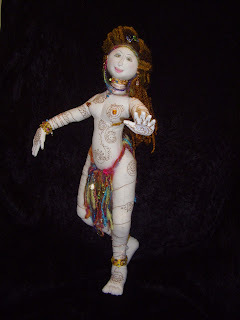 She stands about 18 inches tall and is sewn, stuffed and embellished with yarns, threads and beads. I added wrapped wire and charms. I've never sewn anything like this. So I was thrilled when she came together relatively easily. I had trouble with the hands and ended up sculpting them in polymer clay. 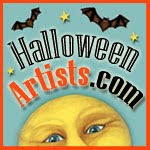 I highly recommend looking at classes offered through joggles.com, especially with this artist! The instructions were great and easy to follow!